Gold and precious stones provide an undeniable synergy. You simply cannot envisage one without the other. In India, particularly, this yellow metal is irreplaceable in precious jewellery. Apart from its complete inertness and resistance to tarnish and corrosion, Gold is as dear as it is because of its rarity. Traditionally, Gold has been used in its yellow form in either 22k or 18k (for increased strength) to make fine jewellery. But with evolving tastes, increasing innovation, and maturing craftsmanship, Gold finds expression in several colours and textures. Karat is the term used to measure the gold content or purity. Before we understand the difference between 24k, 22k and 18k gold, you must know what karat stands for. Karat is basically a unit used to measure the purity of gold. The higher the karatage, the purer the gold. 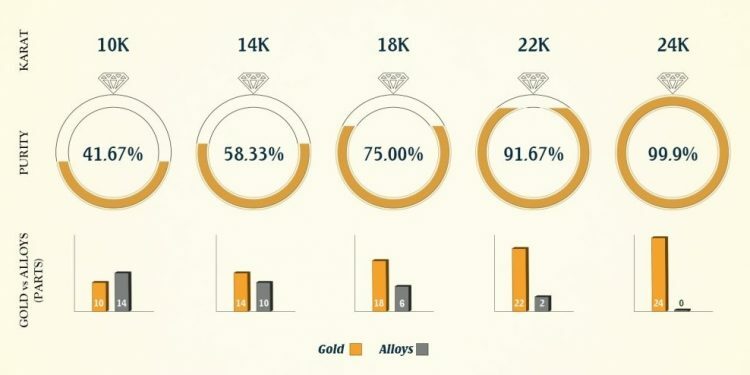 Here’s a simple guide to understanding the difference between 24k, 22k and 18k gold. 24k gold is also called pure gold or 100 per cent gold. This means that all 24 parts in the gold are all pure gold without traces of any other metals. It is known to be 99.9 per cent pure and takes on a distinct bright yellow color. There is no higher form of gold than 24K and you must be aware of this before you go to a dealer who might tell you that they’re selling you 25K or 26K gold. Since this is the purest form of gold, it is naturally more expensive than 22K or 18K gold. However, this type of gold is lesser in density as compared to gold of a lower karatage which makes it soft and pliable. Hence, it is not suited for regular forms of jewellery. Coins and bars are mostly bought of 24K gold purity. 14 karat gold is made up of 14 parts gold and 10 parts other metals, mostly silver and copper, but there could also be zinc and nickel. This alloy contains 58.3% gold and that’s why sometimes you can see 14K jewelry stamped with a mark such as .583 or .585. More often, a 14K piece will be marked as 14K, 14KT, 14k or a similar variation. 10-karat gold is an alloy made up of 10 parts gold and 14 parts other metals such as copper, zinc, silver or nickel. In percentage terms, 10K gold contains 41.7% pure gold. Jewelry that is 10K gold will usually be stamped with a mark such as 10KT, 10K, 10kt or something similar. If you see a mark reading .417, this also means that the item is 10 karats gold. 10K alloy is harder than purer gold mixtures. For that reason, a 10K ring, for example, could wear down more slowly than a 14K piece. 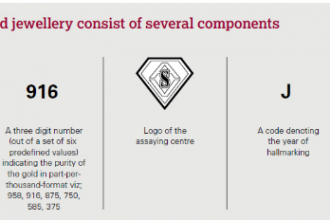 However, this is not always the case, as the durability of a gold alloy depends not only on its gold content but also on the type and proportions of other metals in the mix. Also, the alloy content is just one factor of durability. So it is possible for a well-made 14K piece to be more durable than a 10K one. The biggest downside of 10K gold is that the jewelry made of it is not suitable to be worn by people allergic to nickel since the presence of higher proportions of nickel. Lower Karats are not worth as much monetarily, while higher Karats are worth much more as they are more pure.